As part of my research for the next development prototype of my Guitar Processor, I have been working on valve characteristics, and specifically running them at low voltages. Conventionally, valves ("tubes" for those in the US) like the ECC83 / 12AX7 (a favourite in guitar circuitry) are run at voltages in the order of 200-300V. Some designs deliberately run them at higher voltages to achieve specific characteristics. But what about running them at low voltage? There is no useful data on running them at low voltages, and in fact the standard datasheets only provide high voltage graphs so the operating conditions at low voltages are crammed into one corner of the graph and not too useful! Remarkably it's quite usable with positive gate bias (and gate current of about 1mA) The load line is for a 2k2 plate/anode resistor. Going below a -1V gate voltage the valve rapidly reaches a cutoff point and plate/anode currents fall off rapidly. You can also download my original spreadsheet of ECC83 / 12AX7 measurements at low voltage (OpenOffice / .ods) which includes two more charts for lower grid voltages and anode/plate currents. As it turns out, a 1V positive gate bias and a 20V supply, provided you keep the plate/anode (load) resistor sufficiently low (2k2 in my case), an ECC83 / 12AX7 is completely viable for guitar circuits. In fact it may even be feasible to do designs run the whole lot off a standard 9V effects supply! The only thing to watch is that the heater can be a bit power hungry and 9V is going to be a bit low for the heater. None the less, it should work. Certainly if power valve characteristics translate to low voltage in the same way then it could well be feasible to run a headphone amp for high-impedance (typically the case with audiophile cans). This could be transformerless but it may still be most practical to use a solid-state pull-up (current source). The only risk is that gains would be fairly low at lower voltage, but that's not necessarily a problem with headphones that operate at low levels anyway. 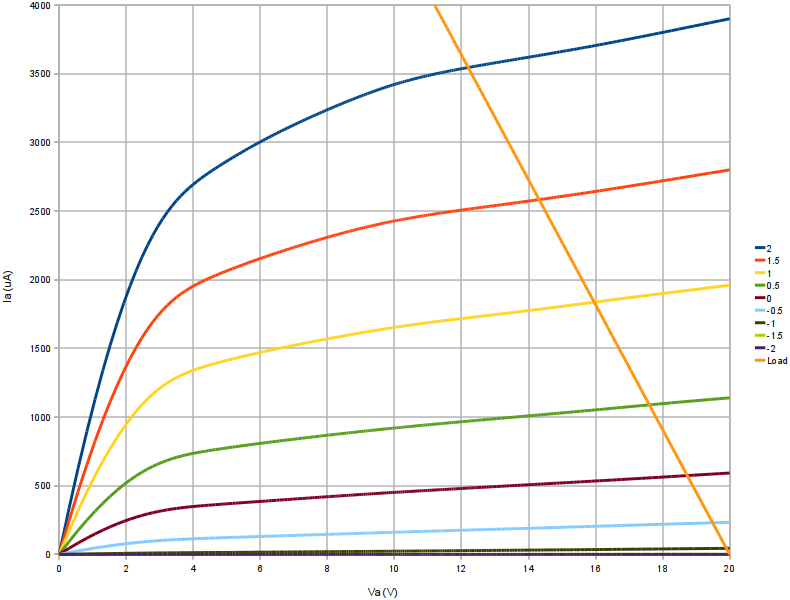 I have used this curve of yours to analyze the circuit behint the tonelab and the VOX Valvetronix amps... I think I am finally grasping the operation point and mode of operation of the tube in that circuits, and I would like to discuss my findings with you if you are interested. How about that? Thanks for your data, very interesting. What are the noise levels like at low anode voltages (12v) compared to 'normal' (200-300v)? Noise as not been a problem for me so I've had no reason to look into it closely. The biggest differences I've had to deal with is the the low gain you are likely to get (can't hang a high value resistor on the Anode) and the fact that you are likely to have to venture into positive grid voltages resulting in significant grid conductance.